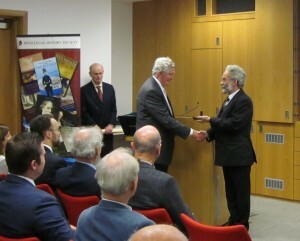 The 2015 Annual General Meeting of the Irish Legal History Society took place at the Public Record Office of Northern Ireland on 27 November 2015. Reports from the Secretaries and Treasurers were delivered, and auditors and office-holders were elected for the coming year. Maggie Smith, the Director and Deputy Keeper of the Records welcomed members of the Society and explained the Public Record Office’s operation and collections. The Gold Medal of the Society was awarded to the Hon Mr Justice Ronan Keane, former Chief Justice of Ireland. Mr Robert Marshall’s term as President of the Society ended and the Hon. Sir Donnell Deeny now takes the reins. Attendees at our autumn discourse and AGM in November were treated to a specially-curated exhibition and tour of the Public Record Office of Northern Ireland. 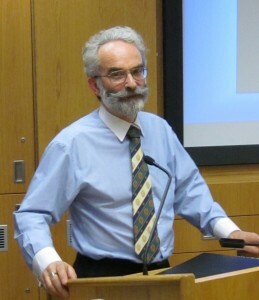 Archivist Des McCabe selected a number of significant and fascinating documents which were of interest to legal historians, and explained the workings of the Public Record Office. PRONI is the official archive for Northern Ireland and contains millions of documents that relate chiefly, but not exclusively, to Northern Ireland. They date largely from c.1600 to the present day (with a few dating back as far as the early 13th century). Located in Belfast, PRONI is a government organisation founded in 1923 (shortly after the partition of Ireland). It now operates as part of the Department of Culture, Arts and Leisure within the Northern Ireland Civil Service .